If you have not watched the first season of the Chilling Adventures of Sabrina you have to go do that right now because it’s great! Also, this article will contain spoilers! While Netflix’s take on the comics ended with Sabrina accepting her destiny and epically taking on the full extent of her powers by signing her name in the Book of the Beast, there was also heartbreak. Summoning that powerful dark magic to save everyone left her no choice but to end things with her boyfriend Harvey Kinkle in order to protect him. While Harvey finally finds it within himself to forgive Sabrina and accept her second nature, it was the teenage witch who realized that may not be the best idea. ‘I had to do something tonight that scares me, Harvey. It touched something dark inside me. I do not know if it is safe for me to be around you, Ros or Susie… I love you way too much to risk anything bad happening to you,’ she tells him. Now, during an interview with ET while at the show’s premiere, the cast discussed the unfortunate ending to the sweet romance the two characters had. ‘It’s kind of sad, isn’t it? 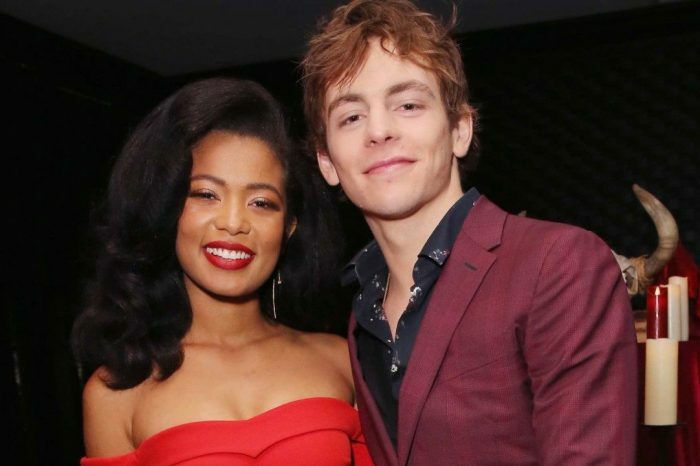 Because you want Harvey and Sabrina to be together, it’s an iconic couple,’ Ross Lynch, who plays Harvey, said. Interestingly enough, it was Nick Scratch who assured Harvey of Sabrina’s feelings for him even though the Academy of Unseen Arts classmate is also interested in her. ‘I liked that scene! I also really enjoyed Gavin [Leatherwood] and my relationship, so just having a full day on set and working with Gavin, which obviously I don’t really get to do in general, was just really fun. We had a really, really good day. It was fun,’ Lynch shared.